The following is a history of the buildings and businesses that have stood over the past century-and-a-half in the location of what used to be Frank Swift's "Howes Clothing Company" and in recent years was the south end of the Vineyard Dry Goods store building, on the west side of Main Street in Vineyard Haven, Mass. 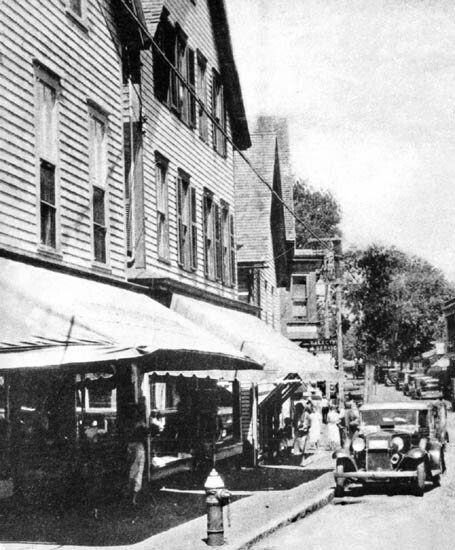 Stan Lair said: "[This] building was Godfrey's Clothing Store, then it was Howes' Clothing, and Frank Swift's Clothing, and now it is part of Vineyard Dry Goods store." Before the fire, this site and Site #27 to the south were a single property. A dwelling house stood on the south end, and a store building was on this end. For the early history of this property, see Site #27. The 1858 Walling map shows that a small, separate store building had been built on the edge of the property facing Main Street (then part of Dr. R. K. Jones' property - see Site #27.) We might speculate that Dr. Jones may have had his office here, or sold medicines from this little building. In 1860 part of this property was leased by West L. Blish (1832-1897), who ran a jewelry store here. His lease expired in August 1864, and it is unclear whether he renewed it. (See Site #6 for more on Blish.) As he owned the building itself, Blish may have moved away the entire structure of the store building when his lease expired. Blish was born in Maine, the son of William and Katherine Blish of Maine and Tisbury. He never married. By the time of the 1883 fire, his store stood on his property at Site #6. In June 1867 the Gazette reported that "Mr. Richard W. Coffin, of Holmes Hole, is about erecting a new store, upon the premises owned by him. It is a two story building, of modern style, and to have every convenience for his large retail business." Until this time Coffin had maintained his store in the basement of the Baptist Church (See Site #23.) 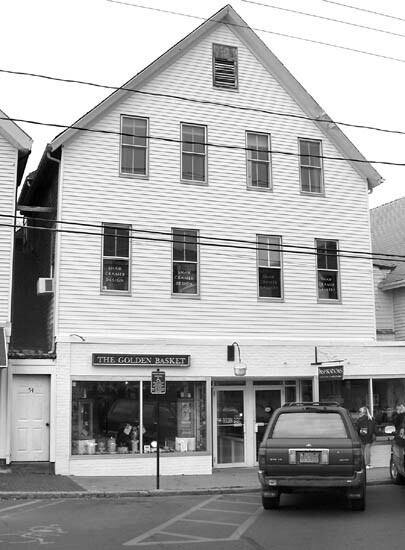 The 1870 Tisbury census lists Coffin as the keeper of a dry goods store. What did R. W. Coffin sell here? April 1869: New style sackings, alpacas, poplin alpacas, Butterick's patterns, carpetings. Oil - wool - hemp - straw - &c.
Nov. 1871 - Jan. 1872: Corded, plain, and plaid alpacas; wool poplins, new shades, steel luster, empress cloths and thibets, tycoon reps, delains and prints, dress and cloak trimmings, cloakings, &c. Cloaks made to order. Velveteens and velvet ribbons. May 1874 Dry goods, groceries, crockery, glassware, small wares, etc. In December 1870 Coffin held a "Selling Out!" holiday sale of dry goods, groceries, and fancy goods. He probably closed the store shortly afterwards, and it evidently remained closed for most of the following year. In July 1871 Coffin advertised a new store in Oak Bluffs, selling dry goods and groceries. The following month he advertised kerosene cooking stoves at his Oak Bluffs store. 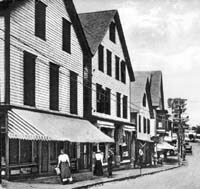 In September 1871 a fire seriously damaged his store in Oak Bluffs, but fortunately insurance covered his losses. 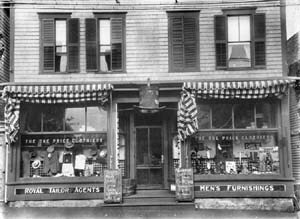 In October 1871 the Gazette announced that "R. W. Coffin has reopened his store in Vineyard Haven" although advertisements throughout the winter of 1871-72 note that he also maintained his store in Oak Bluffs. In March 1872 Coffin held a thirty-day "Clearing Out Sale" before removing to Oak Bluffs for the summer. After another summer of selling dry goods exclusively in Oak Bluffs, he again reopened his Vineyard Haven store for the winter of 1872-73 and maintained a 'branch store" in Oak Bluffs. In June 1873 a one-night string of burglaries in Vineyard Haven captured the island's attention. First, the blacksmith shop of Charles Look at the head of Union Wharf was robbed of some tools. Next, the burglars used a crowbar to pry open the front door of Coffin's store. They stole an assortment of shawls and "general dry goods" (including alpacas, sash ribbons, cashmeres, plated ware, and pocket knives) valued between $300-400. Next, they burglarized the T. Bradley & Sons store (see Site #22.) Following a tip, Sheriff Norton(?) captured two men and a woman from Vermont camping outside the village. The next month Dyer Norton of Vineyard Haven was arrested for helping the three burglars escape. The trio was recaptured, and in October, Amasa Alexander and William Eastman were found guilty of breaking and entering the Coffin's store. Alexander was sentenced to six years in state prison, and Eastman to three years. It's not certain when he moved in, but at the time of the 1883 fire this store was occupied as a grocery and dry goods store by Wendell Crocker. He probably had moved here by September 1879, when the Gazette reported that Wendell Crocker's "former" store (probably Site #2) was occupied by a new dry goods merchant. He might very well have moved here soon after Coffin closed his store, as Wendell's nephew R. W. Jr.'s harness business was already booming by 1874 and already had an eye for expansion. In any event, Wendell Crocker kept a low profile during these years, and unlike earlier years he did not advertise and was barely even mentioned in the Gazette. In 1876 and 1883 Crocker sold school books to the town. Town records also show that in 1879 he sold books (including school books) as well as stationery to the town. Wendell Crocker's wife is known to have invented or at least heavily promoted the name change from "Holmes Hole" to "Vineyard Haven" in 1871. By about 1870 Wendell owned and inhabited the house on the northeast corner of Owen Park and Main street, later inherited by his daughter. He continued in business after the death of his older brother in 1875, and in the 1880 census he was listed as a dry goods merchant. Wendell was married to Sarah Ames Crocker (1830-1909). She was born in Wareham, the daughter of Ebenezer Crocker and Phebe Swift. Wendell and Sarah had two sons who died young, but their daughter Octavia Norris Crocker (1857-1937; evidently named after the owner of this property - see Site #27) married Benjamin Clough Jr. (1856-1938), and became the parents of Mrs. Emma Downs (Clough) Lord and Bradford Clough, who successively ran the Vineyard Shoe Store in the 1930s- see Site #32. An August 1933 article in the Gazette on the 50th anniversary of the fire: "An incident of the fire narrated a few years ago by George Dean was as follows. He was a boy at the time, and he rushed into the store kept by Wendell Crocker on Main street and asked what he should take out. "'Save the things of most value,' said the old gentleman in a quavering voice. Then, not suiting the action to the word, he seized a box containing one strip of penny candy and bolted down the street with it." Within a week after the fire, Crocker had temporarily relocated and reopened. Shortly after he opened a new store nearby - see Site #29. Gratia Harrington, in a 1967 article for the Gazette, wrote of her memories of the early 1890s: "There was a vacant lot between Mr. Crocker's [Site #29] and what is now Vincent's [Site #27]." This end of the property remained vacant for more than a decade after the fire. In the fall of 1895, R. W. Coffin began construction on the north end of his property, approximately where Wendell Crocker's old store stood. In October the Gazette reported that Coffin was erecting a "block" to be used for a store with a dwelling above it. Problems arose immediately as the paper reported that "The stone foundation Mr. Coffin is having built for his new store fell Saturday night, owing to the heavy rain." Nevertheless the building finally went up, and in February 1896 the first tenant, clothier Frank P. Norton, moved in. Norton had an established men's' clothing business, and with his new store he advertised "Larger store space and better facilities." To pay for the new construction, in February 1896 Coffin and his wife took out two six-year, 6% mortgages for $2000 and $800 from Eunice R. Beetle of Tisbury on this property together with the property in the rear "known as the Stable lot." In July 1900 property-owner Mrs. Mary P. Coffin died, and the property was inherited by her daughter Sarah O. (Coffin) Luce. The "store and tenement" were valued at $2500. Martha's Vineyard Cookbook ad, c. 1897. Francis Presbury Norton (1853-1903) was born in Tisbury, the son of Presbury Norton (1776-1861) and Eliza Mayhew (1820-1858). Presbury Norton was an elderly Tisbury boatbuilder and a deacon of the Baptist Church, and Eliza was his third wife, forty-four years his junior. In 1858, when Frank was four years old, Eliza died of lung disease at the age of 38. The 1860 census shows 84-year-old Presbury caring alone for his six-year-old son. In 1861, possibly on his deathbed, Presbury Norton married his 42-year-old fourth wife Matilda Manter, and then died of bronchitis three days later. Frank was raised by his new stepmother. In 1894 Frank married Lida May Allen (1865-?) of Wisconsin. By 1900 they had had five children, all of whom died in early childhood. Until 1895 Norton had his clothing store in Lane's Block (See Site #4.) 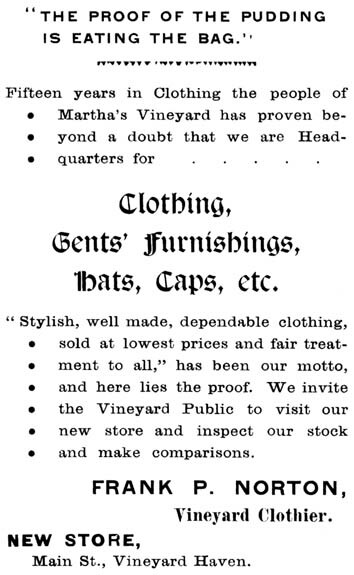 Norton was listed by the town as a "clothier" in 1895, and during 1896-97 Norton advertised in the Gazette as "Frank P. Norton, The Vineyard Clothier." Norton was called a "clothing merchant" in the 1900 census. In 1900 photographer W. G. Ashton exhibited samples of his work in the window of Norton's clothing store.
" In November 1903 Norton died in New Haven Mills of complications following an attack of pneumonia. William Look (1867-1937) opened a clothing and dry goods store here shortly after F. P. Norton left the island. In February 1902 the Gazette reported that clothier William Look was moving back to Lamberts Cove, and in March 1902 the paper reported that "Will Look" had closed out the balance of his dry goods store. Look was from Lambert's Cove, the son of Tisbury butcher John Look and his wife Mary Cobb, the twin brother of Seth Look, and the husband of Elizabeth Alice L. Luce. His obituary called him "one of the Island's successful farmers" and noted that he "attended the Bryant and Stratton business college. He spent his life in the management of the Lambert's Cove farm, except for a single year when he bought and operated a clothing business at Vineyard Haven, later selling the business and returning to the farm." All five of his brothers worked for the grocery firm of Look, Washburn & Co. (See Site #4.) Look is listed in the 1900 West Tisbury census as a farmer, in the 1907 directory at Lambert's Cove, and in the 1900 West Tisbury census as a farmer living on Lambert's Cove Road. He died in 1937 in the home in which he was born. In April 1902 the Gazette announced that W. E. Godfrey had opened a clothing store on Main street formerly occupied by William Look. He sold men and boys' clothing, hats, caps, and furnishings. Clothier Cranston F. Godfrey was listed as the manager. In June 1902 C. F. Godfrey moved his family from Falmouth to Vineyard Haven. By August, Godfrey was calling his business "the Vineyard Clothier" and listing his location as "the old stand of F. P. Norton." In December 1902 Godfrey lighted the store with acetylene gas. In January he advertised clothing and furnishings. In March 1903 Godfrey held a "Removal Sale" and announced that "on April 1st we shall occupy the store in Lane's Block next door to the Post Office." In August this was probably the Main Street store owned by Mrs. S. O. Luce listed as "recently vacated." By October 1903, Wilfred E. Godfrey of Falmouth was in bankruptcy proceedings with the Commonwealth of Massachusetts. It is not known who was at this location during 1903-1906. 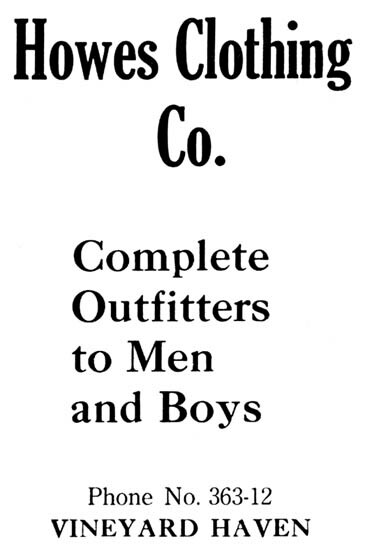 Possibly tailor M. J. Dahill, as seen in the prominent sign in the photo on the next page, or possibly the clothing store of Henry Howes, who bought all of Godfrey's stock and store fixtures in January 1904. Godfrey opened his new clothing store in March 1906 "at our old stand (store formerly occupied by William Look)." Mr. M. J. Dahill was listed as having charge of the tailoring department. 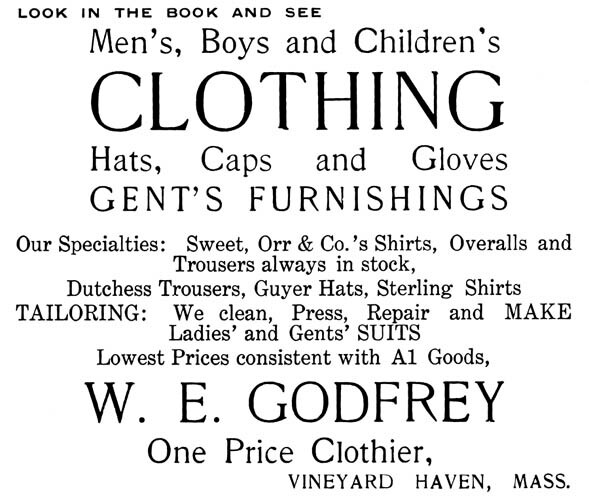 By January 1907 Godfrey's clothing store had a telephone installed. 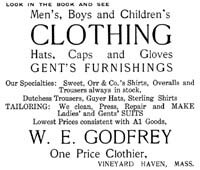 The 1907 Vineyard Haven Directory lists Wilfred E. Godfrey as the "One Price Clothier" and tailor Morris J. Dakill as his employee. See Site #30 for more on Godfrey. Tailor Maurice J. Dahill (c.1852-3 - ?) was from New Bedford, the son of Irish parents, and the husband of Rebecca A. _____. They were living in Rhode Island in 1880 and in New Bedford during 1887-1890. He came to the island between 1900 and 1906, and evidently left the island before 1920. Circa 1905-10. Was Godfrey located here at this time, or was Dahill running his own business? Vincent's Paper Store (Site #27) is visible on the extreme left, Ernest Tilton's hardware store (Site #29) is seen to the right of Dahill's sign, and Lane's Block (Site #4) is visible on the extreme right. Josiah Bodfish opened his store here next. He bought this store building and the one next door (see Site #27) in the spring of 1907. Josiah Parker Bodfish (1854 - 1913) was born in West Yarmouth, Mass., the son of William Parker Bodfish and Polly Crowell of Barnstable and West Yarmouth. He was the brother of Prentice, William, Capt. Hartson, and Eben, and the husband of Lucy Porter. Lucy was born in Halifax, Mass., the daughter of Oliver C. Porter (1827-1873) and Malansa Blanchard (1833-?). The New Bedford Evening Standard noted in his obituary: "As a young man, he was for some years in business in Tacoma, Washington. He married Miss Lucy Porter, of Whitman, in 1893. Shortly after his marriage, he returned to Tacoma, where Mr. and Mrs. Bodfish lived for years. 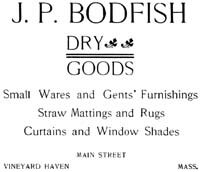 Ten years ago [c. 1903] Mr. Bodfish became a stockholder in the J. V. Spare company." Elsewhere the paper stated that he was "one of the original stockholders of the J. V. Spare company of New Bedford and employed there for five years." His obituary continues, "After several years with this company, he was obliged to retire to Martha's Vineyard, because of failing health. For some time he was connected with Luce Brothers, in this town, after which he went into business for himself, and was successful. Failing health, however, again obliged him to retire about one year ago [1912.] He was esteemed for his business integrity, for his gentleness and courtesy." 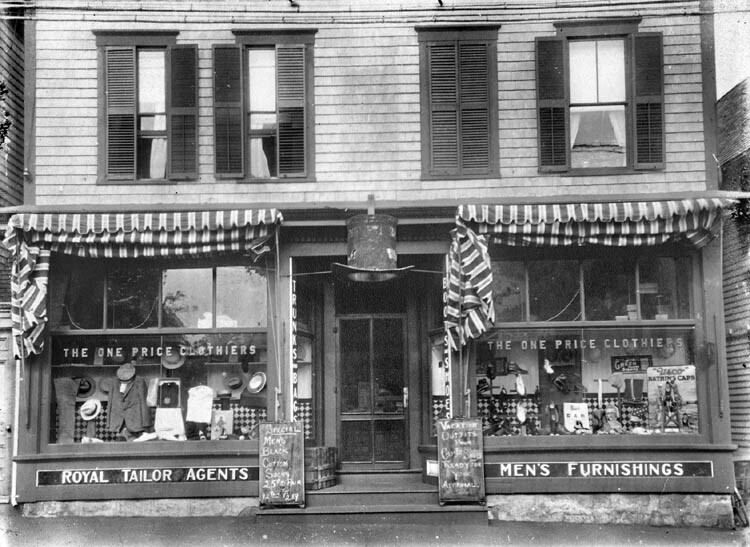 In April 1905 Josiah Bodfish of New Bedford was reported to be opening a store in Vineyard Haven "to succeed Eagleston Bros." He had rented part of Lane's block (Site #4) for his new enterprise. However, the store opening was postponed because of illness. In April 1907 landlady Sarah O. Luce sold this property to Bodfish. 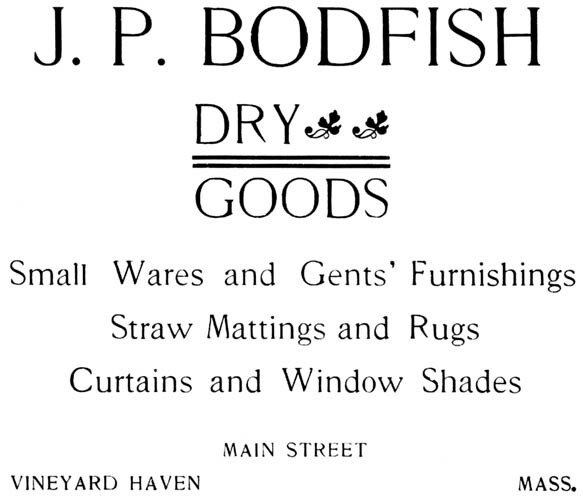 The 1907 and 1910 directories of Vineyard Haven list Josiah P. Bodfish as the proprietor of a dry goods store on Main Street, near Centre Street, and living at the same location. Mabel West (1889 - ; daughter of stableman Clement West) began work as a clerk in his store in May 1907. In 1907 Bodfish was reimbursed by the town for providing clothing to the poor. In October 1908 Mrs. E. P. Bean opened a stock of fall and winter millinery at Bodfish's store for three days. This detail from a c. 1912 postcard shows this building occupied by "H. S. Howes Clothier." Vincent's paper store (#27) is on the left, and Ernest Tilton's hardware store (#29) is on the right. RL: Howes' clothing. Which was Frank Swift, later on. Mr. Howes, Theodore's father, worked in there. I just remember him, I think. SL: Now that's part of Vineyard Dry Goods, now. RL: Yes, now, yes. But that entryway that goes up was still there when I was a... And the apartments upstairs, see. Although for decades this store was known as the "Howes Clothing Company," Mr. Howes did not have his store here very long. He probably moved his business here in 1911 and kept it until his death in 1912. Henry Sparrow Howes (c.1868-1912) was born in East Harwich, and was the son of Sparrow Howes and Deborah A. Nickerson of Chatham and East Harwich, and the husband of Lois A. Horton and the father of Theodore C., Josephine S., H. Lott, and Francis G. Howes. Before 1899 he had a confectionery, cigar, and periodical store at Site #27. In 1899 he moved to Boston, but returned about two years later. He established a clothing business here about 1904. 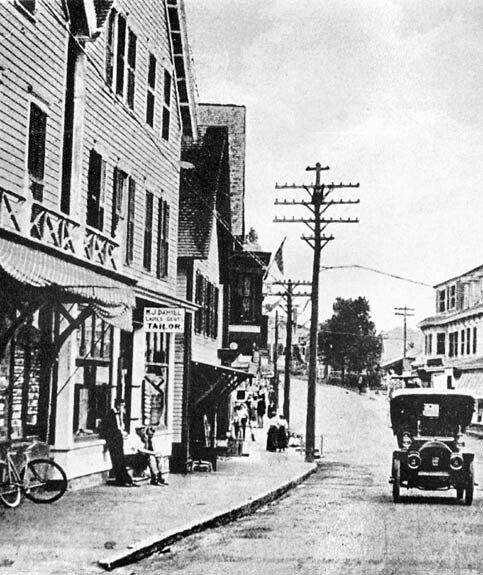 In January 1904 William M. Critchell, representing the creditors of W. E. Godfrey, sold all the clothing, caps, hats, and furnishing goods then in Godfrey's Vineyard Haven store, as well as all the fixtures except for the cash register and the "gas machine" for $1200 to Howes. It's not certain where Howes' clothing store was during these years. A February 1905 Gazette made mention that "Henry S. Howes has moved into his new store at the corner of Main and Spring streets." 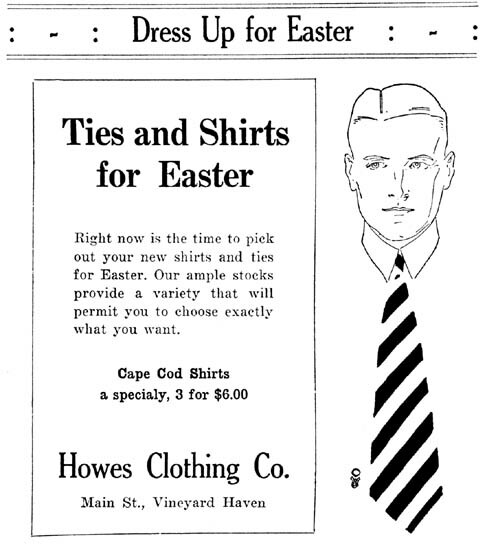 In March 1907 "Howes, the Clothier" was advertising as "still at his 'old Stand' next to the post office, Vineyard Haven." 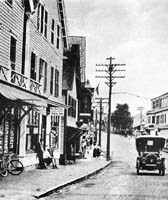 The 1907 and 1910 Vineyard Haven directories list him at the corner of Main and Church. In October 1909, he is known to have been in part of Castello's Block (Site #33) next to Walter Norton's ice cream shop. In January 1911 the Gazette reported that C. M. Vincent was planning to move into store then occupied by J. P. Bodfish and that Henry Howes was to remove to Vincent's store. These plans were evidently changed, as Howes appears to have moved into Bodfish's store about this time instead. In January 1912 Henry S. Howes died at the age of 43 of tuberculosis. His occupation was listed in his death record as "retail clothing dealer." His estate included "Store Fixtures and Stock" consisting of $4000 worth of clothing, hats, caps, gents furnishings and shoes. Howes' widow, Lois A. Horton (1875-1951), was the daughter of Perez and Lois Lewis Horton. She married William Claghorn in 1939. SL: Henry Howes. You don't remember him. SL: He was Joe Howes' brother. He ran Howes Clothing Company on Main Street. He was the father of Ted Howes - you remember Ted Howes? Lot Howes, Francis Howes, Josephine Howes. They lived on the corner of William Street and Church Street for a good many years. And he ran the clothing store down on Main Street.
" 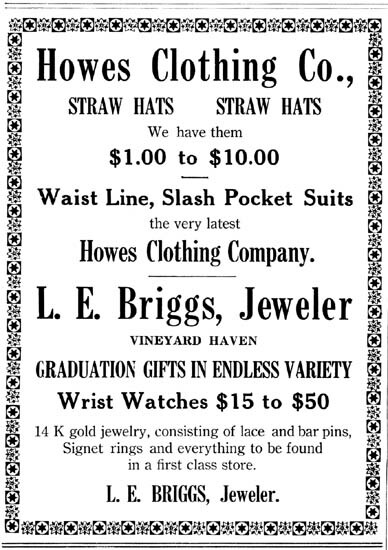 A 1929 article recalled that "[Briggs'] talent for activity and his energy led him to purchase a clothing store and to operate it with pronounced success for several years." In November 1912 it was reported that Mr. Edgar, the clerk in "the clothing house of L. E. Briggs and Co." was about to leave, and that his place was be taken by William Ward Claghorn (1874 -1947). 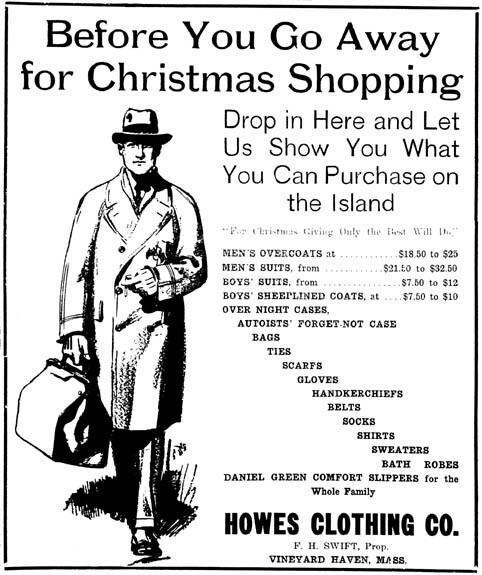 The Howes Clothing Co. continued to advertise through the 1913 summer season. Landlord Josiah P. Bodfish died in November 1913. This property was probably the "Store + Tenament Building, West Side Main Street" valued at $4233. It was inherited by his widow Lucy P. Bodfish. The 1914 Sanborn map clearly marks the store as "clo." for clothing. Stan Lair said: "Frank Swift, he ran a clothing store. Formerly it was Howes Clothing, but Frank ran that store for a good many years." Connie Leonard said: "What in the dickens did Frank Swift sell? It seems to me that it must have been men's clothing. And also I think it might have been sheets and towels, you know household. It was always very dark in there. Do you remember how dark it was in Frank Swift's store? And sometimes I think he burned incense." "It was Howes Clothing Company before Frank Swift bought it. And you remember Theodore Howes? That was their family." 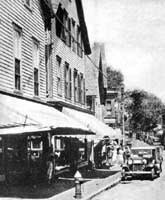 Frank Swift purchased the Howes Clothing Co. about 1919, shortly after his discharge from the Navy, and in January 1920 Lucy Bodfish sold the property to Swift. The 1920 census of Vineyard Haven lists the 28-year-old Swift as a retail clothing store merchant, living with his wife, his widowed mother Rhoda, and his sister Doris M. Swift, who worked as a stenographer at the bank (Site #1.) 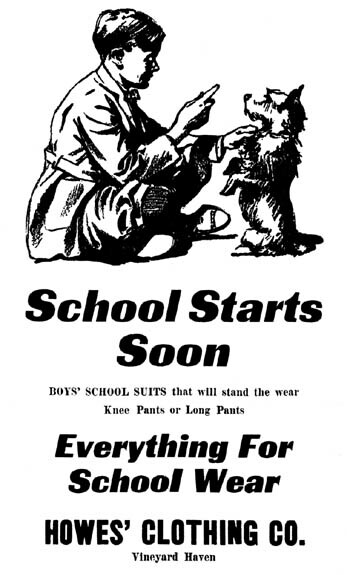 In August 1920 the Howes Clothing Co. advertised boys' suits, trunks and bags. Franklin Holmes Swift was born in 1891 in Vineyard Haven. He was the son of Holmes and Rhoda Luce Swift, and the husband of Sophie Heyermann. In the summer of 1921 Swift bought the Holmes, Luce & Co. business, which was next door to the post office (see Site #32). The Gazette reported that he was planning to conduct this household furnishing business under new management. 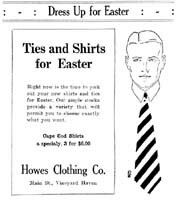 During 1922 Swift advertised the Howes Clothing Co. jointly with the oil stove business of Swift & Whitney. 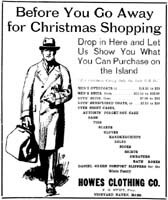 In February 1922 the Gazette reported that the Howes Clothing Co. was holding a "closing out sale" and that the company was now in the hands of L. C. Torrey & Co. of Buffalo NY, adjusters. Dean H. Swift worked at the store during this "clearance sale." In August 1925 Swift advertised straw hats, and in March 1926, suits. In October 1925, Will Claghorn was listed as an employee of Howes Clothing Co. He evidently had worked for the company since Briggs hired him to work here in 1912. Claghorn was the son of Capt. William Bartlett Claghorn and Lucretia Cleveland. According to his 1947 obituary, Claghorn "had worked all his life as clerk in various stores in the village. Because of the nature of his work, Mr. Claghorn was extremely well known to the Islanders and the summer visitors, and was a man of whom everyone was fond." He was the last of the name of Claghorn on the island. By November 1926 Swift had a second store in Edgartown, which he ran until at least 1928. In February 1929, Swift publicly denied a rumor of the sale of his business. In April 1929 Swift's store was redecorated, and new showcases built. He announced plans to remodel the front, possibly with bigger windows. By 1933 Howes Clothing Co. was selling shoes in addition to men's clothing, and in August 1936 Swift was advertising sneakers, socks, and bathing suits. Swift was commonly referred to as a "haberdasher" in the paper during the 1930s. During the summer of 1933 Mrs. William J. Look was listed as the "hostess" of Swift's "ladies dept." In May 1937 Mrs. Lavinia West started work for the company. In April 1935 the paper reported that "The former management having departed, the restaurant in Lane's Block is now under the management of Franklin Swift." And in July 1935 "Swift's" restaurant was advertising on Union Street. During World War II Swift served as a member of the town's tire rationing board. In 1938, former clerk Will Claghorn married former owner Henry Howes' widow, Lois A. (Horton) Howes. By this time Claghorn had left the employ of Swift and was working in the fish department of S.B.S. Barbara Donald said: "He had men's clothes. Then he got in a section where he had women's' clothes, on the other side. And then, when Frank Swift died, the Levine's bought his store and connected them." Dorothy Brickman said: "Frank Swift's store. I remember there was stairs you had to go up. I remember he was a nice-looking gentlemen. I remember he was in a play once at the town hall, in a uniform. He was very handsome. I don't know what play it was in town. There was a dramatic group. But in his store he sold men's and boy's things, boys knickers and boys pants and shirts and all that kind of thing." Bob Renear said: "He had mostly like men's clothing. We bought shirts and socks. I don't think we bought shoes there because we bought those at Clough's, next to the Post Office." "I always remember [Swift] because he was the last one I knew that used to roll his own cigarettes." Marge Taylor said: "Oh yes, I remember him. You used to have to go up stairs to get to his store, a step. I remember him. He was a tall slim man." Agnes Rice said: "It was sort of a haberdashery. He sold mostly men's clothes and hats and stuff. Yeah, I'd go in there. His wife used to work there. And I'll tell you who worked there - Mary Oliver. Her husband was Jesse Oliver? She worked there for years. And I think maybe I went in there because she was my neighbor - she lived across the street from me, and my mother and she were very good friends. So we would go in there and say hi and talk to Mary. I think my mother bought a few things there, you know like ties and stuff for my father. I don't think it was a very busy store. He was kind of a dapper kind of a man. Dressed very well, and always very gentlemanly and nice - pleasant man." BW: Well Frank I remember owned one of the stores that is now part of the Vineyard Dry Goods Store. He had a men's clothing store there. He always used to stand out front smoking cigarettes and talking with everybody that went by. He lived at the top of the Main street hill on the left - it's the last white house on the left just as you go over the brow of the hill. SL: Do you remember what kind of a car he had? It was a composite thing. It wasn't a Moon, but something like that. BW: No, the last car I remember him having was around a 1937 Ford. That's the last car I remember. SL: Well, before that he had this car that was sort of a composite deal that wasn't a standard brand I know. BW: Well Frank didn't have too much that was standard brand! and I beat him! (Laughs.) I didn't know how to play checkers! But anyway [he asked] did I want to play again? I said no, that's it. I knew darned well he'd beat me the next time. "He was a haberdasher. He sold men's things, mostly. I don't remember if he sold shoes. He probably did. But other men's clothing, And even suits. He would take the measurements and send them off and somebody off-island would make the suit and send it back. "Well there was one [employee] and I don't remember what his name was. He was an elderly man who worked with my father. But I think he died and then Daddy didn't get anybody to take his place. [Mary Oliver] worked there for awhile. She was just like a clerk. My mother worked there. Well I was in there, but I didn't work or anything. "[It was a quiet store. He spent time] reading adventure stories." "[His friends] would probably describe him as a quiet man. He was a Mason. We belonged to the Methodist Church, and he sang in the choir. He had a very lovely tenor voice, and he used to sing solos. Occasionally the church would put on plays and people who belonged to the church would act in them. He did, yes." "He was a firefighter in Tisbury, probably around 1930. He belonged to the Legion. In 1927 and 1928 he served as Worthy Patron of Celestia Chapter of the Eastern Star." Walter Renear said: "You went upstairs to go into Swift's. I do remember we got what was called beer jackets, a white canvas jacket with snap buttons. They would stencil whatever you wanted on the back. They were popular in the colleges, so they brought them down here for the summertime. I saw one not too long ago, and I said 'where did you get it?' 'Oh - they're coming back at Princeton!'" CI: "You had to walk up three or four steps to get into the store. It was a very gloomy, gloomy store." JB: "It was gloomy. Mostly, was it men's?" CI: "Yes. Mostly men's, but then he started getting some women's overcoats, because I bought a storm coat in there once." HG: "But he had mostly yard goods. Big bolts of yard goods"
CI: "I don't remember that, I do remember the rainwear." JB: "I don't remember too much about it. I remember the steps and sitting on them. Sam Issokson said: "He had a nice haberdashery shop. It was nothing elaborate, but a good line of clothes. A very neat store. I thought he was a very nice person. I thought it was a nice shop. My father used to do his alterations. [He'd] go across the street. I thought he was a real nice gentlemen." Swift retired in March 1949. In April 1949 he and his wife sold the property to Alfred Hall of Edgartown. Frank Swift died in January 1950 at the age of 58. In January 1950 this building was referred to as the "Vineyard Dry Goods Annex" and was the location of a sale of goods from both Brickman's and Vineyard Dry Goods. In February 1950 a huge hole was excavated under the building, and work was begun by Leo DeSorcy to enlarge this store and connect it to the Vineyard Dry Goods store next door. Swift's floor was lowered and the front steps eliminated, and a narrow passage was built to connect the two buildings. A single wall of "red colonial brick" was built across the front of the double building. In June 1950 Vineyard Dry Goods reopened. Proprietors David and Ida Levine advertised their enlarged store as a "women's store with children's garments and necessities." See the next section (#29) for the history of Vineyard Dry Goods. Dorothy Brickman said: "They bought Mr. Swift's store, because it was growing. My sister and her husband had foresight, and they expanded the material business, eventually went out of it, but then they went into a large stock of dry goods - you know, sheets, pillow cases, blankets, and all of that. Then they went into women's wear and children's things. The amalgamation of both stores became like a little department store, featuring women's children's and garments."